Opening Reception: Thursday, November 10, 2011, 7:30pm, Awards announced at 8pm. A show featuring representation work reflecting the small town character of Elora, Fergus and the rural environs within the boundaries of Centre Wellington. 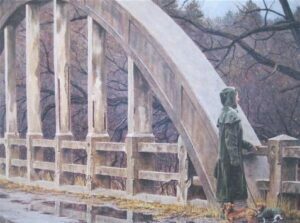 In April of 2011, the Elora Centre for the Arts sent out a call for submissions for the third bi-annual Shirley Dilworth Jaychuk Painting Competition. Artists were invited to submit representational painting(s) in any paint medium that reflected the small town character of Elora, Fergus and the rural environs within Centre Wellington. Shirley Dilworth Jaychuk had a lifetime love of art. Perhaps it was genetic – her paternal grandmother was an accomplished portrait painter and her paternal aunt painted exquisite miniatures. Shirley was especially fond of the Group of Seven and specifically A.Y Jackson, A.J. Casson and J.E.H MacDonald. She also enjoyed the French impressionists and Van Gogh. Upon her passing in 2006 wanted to do something to keep Shirley’s love of art alive. Stan had painted in his youth but gave it up for a career as a business systems analyst. He made an exception where his beloved Shirley was concerned and always agreed to paint landscapes that Shirley admired. After several conversations with the staff and board of the Elora Centre for the Arts, the Shirley Dilworth Jaychuk Painting Competition was created. In early October, jurors met to assess the 110 entries that had been received. After an arduous day, 30 submissions were chosen to be a part of the four week exhibition in the Minarovich Gallery which runs from November 10 to December 4th. Because of the tremendous response to the call for entry, the Elora Centre for the Arts will be showcasing the remaining paintings in Exhibit B – the Stage Room on the second floor. Organizers wanted to ensure that these wonderful paintings were seen by the public before they returned to the artist’s home communities. On Thursday, November 10th at 7:30 pm the jurors will return to the Centre for the Arts for the opening reception and to announce the first, second, and third place award winners, who will each receive cash prizes. Jurors include Ann Roberts, Linda Risacher Copp and Eileen MacArthur. Everyone is welcome to attend. Many of the paintings are for sale. Gallery hours are Monday to Friday from 9:30am – 3:30pm and Saturday and Sunday from 1:00pm to 3:30pm.